Walter Onnoghen, the suspended Chief Justice of Nigeria (CJN), has filed a motion at the Code of Conduct Tribunal (CCT) seeking that Danladi Umar, the CCT Chairman, disqualify himself from prosecuting him. In the suit, Onnoghen posited that Umar is not qualified to try him, as he is also being investigated for bribery by the Economic and Financial Crimes Commission (EFCC). He also accused Umar of the likelihood of bias in the case against him. 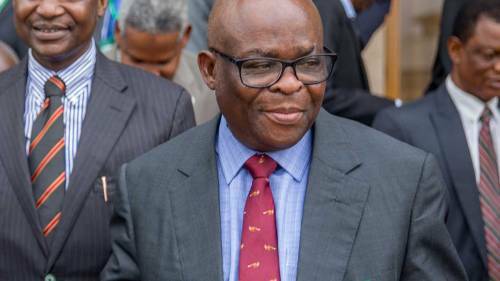 Onnoghen filed the case is pursuant to Rule 12(1) and (1A) of the Revised Code of Conduct for Judicial Officers of the Federal Republic of Nigeria, 2016 and under the inherent jurisdiction of the tribunal. According to the suit: “The applicant is seeking an order of this honourable tribunal for the honourable chairman of the tribunal, Honourable Danladi Umar, to disqualify/recuse himself from further participating in the adjudication of this case on the grounds of real likelihood of bias. “The CCT Chairman has constructively convicted the CJN sought to be arraigned before him without either hearing from him or his being formally arraigned. “The learned chairman of the CCT (Hon Danladi Umar) is a tainted arbiter by reason of a criminal charge at the instance of the EFCC for receiving bribe money in the sum of N10m in charge number: CR/109/18 in FCT High Court by an organ under the supervision of the Attorney General of the Federation. Onnoghen maintained that he has no confidence in the chairman of the tribunal to do justice between parties in his case as he is a man on a mission to please his masters. The suit was supported by an affidavit deposed to by Blessing Ezedimma, a lawyer, who stated that the CCT Chairman granted an ex-parte order removing Onnoghen from his position without trial. The suit was signed by Onnoghen’s counsel: Chris Uche (SAN), Chief Sebastine Hon (SAN), Okon Efut (SAN), Chief Ogwu Onoja (SAN), Noah Abdul and George Ibrahim.